The pursuit of happiness is a defining theme of the modern era. But what if people aren't very good at it? This and related questions are explored in this book, the first comprehensive philosophical treatment of happiness in the contemporary psychological sense. 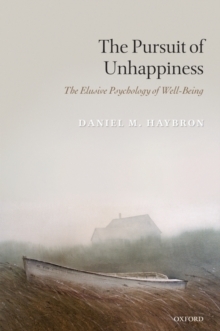 In these pages, Dan Haybron argues that people are probably less effective at judging, and promoting, their own welfare than common belief has it. For the psychological dimensions of well-being, particularlyour emotional lives, are far richer and more complex than we tend to realize. Knowing one's own interests is no trivial matter. As well, we tend to make a variety of systematic errors in the pursuit of happiness. We may need, then, to rethink traditional assumptions about human nature, the goodlife, and the good society. Thoroughly engaged with both philosophical and scientific work on happiness and well-being, this book will be a definitive resource for philosophers, social scientists, policy makers, and other students of human well-being.